Testosterone undecanoate is a synthetic androstane steroid and a derivative of testosterone. 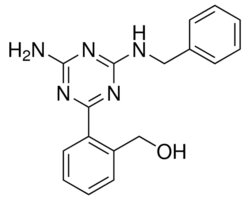 RU 58841 is a specific androgen receptor antagonist or anti-androgen. RU 58841 (PSK-3841) has a dramatic effect on hair regrowth. CID 1375606 is a GPR27 agonist. (R)-Bicalutamide is an active competitive non-steroidal androgen receptor antagonis. Ogerin is a selective GPR68 PAM, suppressing recall in fear conditioning in wild-type but not in GPR68-knockout mice. Kaempferide is an O-methylated flavonol, a type of chemical compound. It can be found in Kaempferia galanga (aromatic ginger). The enzyme kaempferol 4'-O-methyltransferase uses S-adenosyl-L-methionine and kaempferol to produce S-adenosyl-L-homocysteine and kaempferide. P-glycoproteins. Tibolone is a synthetic estrogen used for treatment of symptoms of menopause and prevention of osteoporosis. Tibolone has been associated with rare instances of acute, clinically apparent liver injury.